Crockpot Freezer Cooking – Busy Moms need quick, easy solutions for the every day things that we do. Like cooking. If I don’t have a plan of attack for dinner it’s either going to be a cereal night or drive through. I’m not Martha Stewart. I’m an every day busy mom trying to juggle 4 kids and everything else that us moms have going on. And as far as cooking, I’m not a chef. When I look in my cook books or on the internet for recipes, sometimes I feel like I’d have to go to culinary school in order to make some of those meals. Half the time I don’t even know what some of the ingredients are. When I cook, I cook the basic meals…down home, home cooking. Does that sound like you too? Either way, I think you’re going to love what I’ve put together! I love the idea of Freezer recipes and Crockpot Freezer Cooking or even bulk cooking. You take a few hours on one day putting it all together and then you have meals ready for days. Again, busy moms need quick, easy solutions for the every day things that we do. When looking for recipes, I gathered several hamburger recipes, several chicken recipes and then some odds and ends and grouped them together by meats. I obviously did this on purpose. I chose 4 Hamburger Crockpot Recipes so that I could cook my hamburger in bulk as well as the chicken. Then I could quickly prepare each group of freezer meals by the meat all at the same time. There are a lot of different options with Freezer Cooking. I took some of my recipes and just converted them to crockpot or converted the crockpot recipe to freezer so adjusting the cooking times may be necessary. The other thing to note with meats, chicken especially, is that you can choose to work with raw, frozen or cooked. For the recipes that I’m sharing, I bulk cooked my hamburger and chicken ahead of time and then added it to my freezer baggies. I did not add it raw or frozen. Sometimes when you’re looking at recipes online, they fail to tell you if your meat should be raw, frozen or cooked. I’d rather not assume. Planning is a big part of Crockpot Freezer Cooking. It took me a bit longer to gather all of the recipes, shopping list, etc the first time but now that I have it (and you’ll have it in this nice list) it will be super quick and easy to repeat. Crockpot Freezer Meals Comfort Foods – Coming Soon! 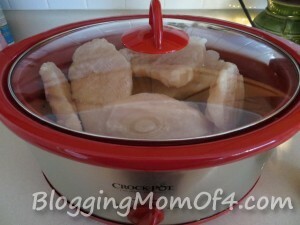 Let me know how you like Crockpot Freezer Cooking! These are great! When are the others going to be posted?? These recipes look amazing..I cannot wait to try them. Can you clarify the whole frozen chicken for me? I saw that you wrote frozen on the recipe- does this mean that you cooked the chicken and then froze it (to add to the freezer bag) or is a piece of raw chicken that was frozen and you added it to the freezer bag. Clearly I am a novice at the freezer meals and apparently at reading a recipe, too! No problem! 🙂 I just buy a bag of frozen chicken breasts. Makes things super easy! This is a big help! I love my crockpot and I really enjoyed this!